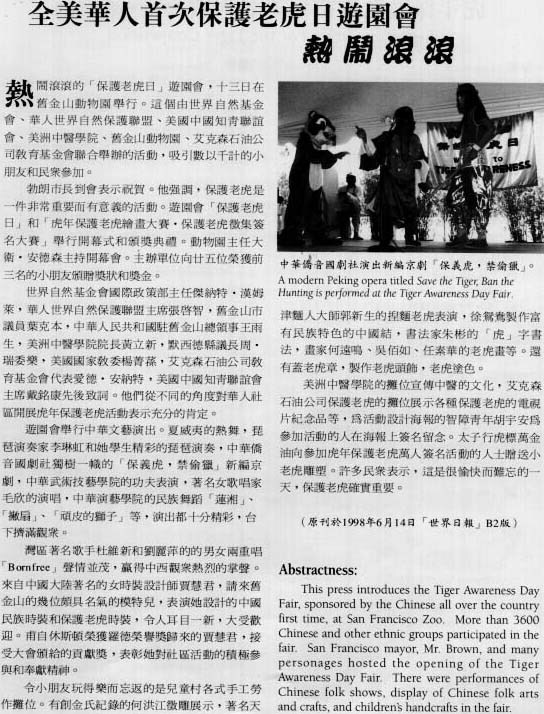 This press introduces the Tiger Awareness Day Fair, sponsored by the Chinese all over the country first time, at San Francisco Zoo. More than 3600 Chinese and other ethnic groups participated in the fair. San Francisco mayor, Mr. Brown, and many personages hosted the opening of the Tiger Awareness Day Fair. There were performances of Chinese folk shows, display of Chinese folk shows, display of Chinese folk arts and crafts, and children's handcrafts in the fair. Previous article: U.S. Congress. Using Tiger Substitutes. Next article : Young Winners of the Tiger Painting and Signature Drive Contests.